It's not nice to use someone's else work without permission. - instead of the mouse-over pause solution that I think solves the problem partially and will still be annoying, I suggest adding a pause/play button to toggle the cycle on and off. Floating the navigation to the left and setting it as a kind of tab helps it become more visible and intuitive. Also, the selected white tab should have a dark border to prevent it from disappearing in light backgrounds. This logic should be applied to all the ellements that don't change over different themes (black background white border and vice-versa). Most of the themes that had a colored box on the header in PJ 2.0 don't display it anymore. I think this must be easy to fix. - as already pointed the rating squares need to be bigger and more spaced. The way it is takes too much time and cognitive load from the user to perceive how many squares there are, or how many are checked. Also, differentiating them by size helps disambiguate what is checked from what is not. Since this doesn't change through themes the same black vs white logic mentioned above should be applied here. - the new proposed solution for the gallerys with a pop-up instead of fixed info like in PJ 2.0, clearly tries to induce exploration by focusing on showing more thumbs and less information. Although, as reported by several users, those informations are viewed frequently while navigating through gallerys. This way, the process of moving the mouse on every piece and waiting for the information to show, is very time consuming and annoying to the user, and tends to generate the opposite intended effect. In this sense, the PJ 2.0 solution of presenting the info all the time on screen seems to be more time efficient to navigate and explore. Also the pop-up system generate some clipping problems that turn some of the information inaccessible, as shown in the image below. This is considered a very serious problem in interface design. The quickly rating feature of PJ 2.0 that has been supressed, was also another time saver convenience for small size pieces, and worked as a way to guarantee not forget rating already seen pieces. The opportunity to compare the scoring between different pieces ensured fairer raitings as well. With all this considerations PJ 2.0 system still seems the best solution so far. reminds me of Marvin from Looney Tunes, specially the burning animation. I second Death-Auron, the white outlines doesn't do it any good. 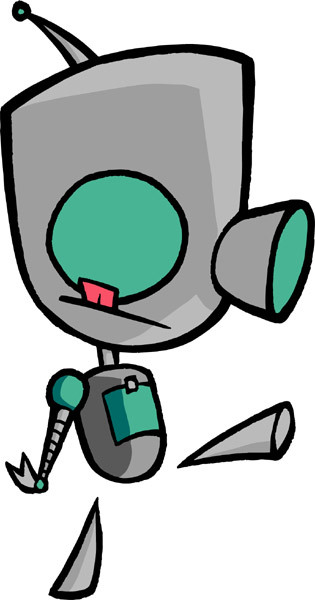 reminds me of Gir from Invader Zim. Animmaniac @ 3/15/2009 05:47 commented on let's go Milo! I really like your style. A bit too saturated this time, but nice as always. The preview probably hide too much from this piece. I passed several times over it and didn't click it, because it didn't get my attention. nice, but too much colors for something grayscale. Animmaniac @ 4/13/2008 17:37 commented on Go Team No Evil! Go! The colors are great but the selout is very disturbing. It gives the impression that this is a crappy resize by the browser. I highly recommend working more on that. Cyan and magenta are switched. Besides, your cyan is green, not really cyan. The yellow could be lighter and the black darker if you want it to be more like true CMYK. Other than that I like the simplistic design. *ah! the browser only refreshed after I posted. Ignore the repeated comments. I like the way you broke with the common pixelart aesthetics and gave it an artistic feeling. I just didn't faved this because, particularly, I don't like jaggyness. Hope you don't mind, but I really needed to see this AA'd so I did a quick edit. The color count is the same. Used 2 colors from the title to AA. Maybe you can find it useful. One of the best iso ever! It's incredible how fast you keep this pixels coming, you sure must have a lot of free time. I don't know if it's on purpose, but the big bridge between the towers is impossible, else it's in an extremly bizarre angle. The center of the two towers are not in the same iso-plane. Maybe you went with an Esher-like approach? I'm probably nitpicking, but the area next the "bonsai trees" also seems to lack detail compared with the rest of the piece. Anyway, it's always nice to study your color choices. It really reminds miascugh's work, mainly because of the colors. The clean pixeling and the subtle use of dithering makes it flawless. I only think you should enlarge the background and give more space for the piece to breath, otherwise remove it. @Adam: Yeah, it's unfinished. As I said earlier, I probably won't work on this game anymore. But even with the head being static, you would hardly notice cause it was supposed to be a fast paced game where the player is always moving. @greenraven: no, I don't have time nor the will to continue it. It's one more abandoned game of mine. @Adarias: I agree that when alone these elements seems a lot better with the darker palette. But in my plans, several levels would happen at a bright sunny beach, so in those cases the lighter palette works better because of the contrast. I tried hard but still don't see any clouded sky. It looks like a perfect render of a orange/lemon peel, though. Thanks for pointing that out. I haven't noticed until now. Will try to fix it later. Is any better without the BG? Thanks jalonso, ilkke and pain. Now I leave my teens to enter my twenties. Animmaniac @ 4/24/2007 09:20 commented on Got color? Yeah, I agree with jal too. You still have an entire week, so why not refine it? If you think is too big to handle, scale it down and work over it. I'm sure this can become a great entry.